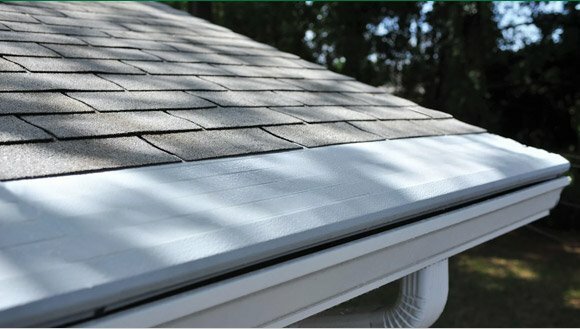 Gutter Helmet offers the most comprehensive and advanced solutions to help prevent water damage. Helmet Heat offers the best solution to problems caused by ice buildup in your gutters. 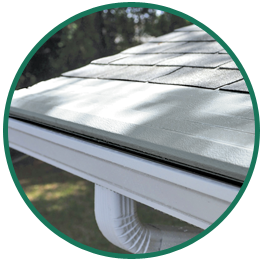 Our Gutter Helmet protection systems are specially made to allow rainwater to flow smoothly through your gutters, while preventing leaves, pine needles, and other loose debris from settling inside. Their patented nose-forward design ensures reliable, clog-free performance no matter the season, while eliminating the need for regular gutter cleaning and maintenance. Our seamless Gutter Helmet protection systems can be equipped with Helmet Heat, an exclusive heat-regulating cable that helps prevent ice and snow buildup around your roof’s edges. During colder months, keep your gutters sturdy and reliable with our premium Helmet Heat system. The crew installed our gutters and completed the job in less time than anticipated. They were friendly, hardworking and cleaned up after they were done. I would recommend Gutter Helmet of Eastern NY to any home owner who needs new gutters. We just had gutters installed on our house. It was pouring rain, cold, and we still had piles of snow in the areas that they had to work in. They showed up on time, never complained and had all gutters installed in less than three hours....in pouring rain! They were great, and we are extremely satisfied! I recently had Gutter Helmet of Eastern NY put rain gutters on my house and recommended them to another friend who had an equally good experience with this company. They arrived at my house at precisely the time he had stated he would. He presented the information clearly and concisely. I never felt that he was trying to "make a sale." When the men came to put the rain gutters on my house, they arrived on time and did their work competently and completely. Job well done in all respects. When the rain fell, as it inevitably does in our part of the world, the Gutter Helmet worked exactly as expected. Very good company to do business with. This is the second time I have hired Gutter Helmet of Eastern NY to install gutters on my home. They have an outstanding product! The work is done extremely well and professionally. I highly recommend them for all your home improvement needs. Never clean your gutters again! 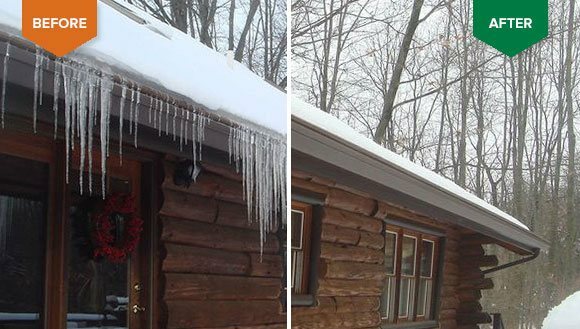 Serving the Hudson Valley and the Capital Region, Gutter Helmet of Eastern NY offers permanent gutter protection solutions for gutter muck and dangerous icicles. Because your gutter system protects your home from extensive water damage, mold and pests it’s important to choose the best gutter system to protect your biggest investment. Gutter Helmet of Eastern NY is your authorized dealer and installer for maintenance free gutter systems that will prevent your gutters from clogging or forming dangerous icicles. We are the top choice for quality and professional installation of premium gutter protection systems including Gutter Helmet, Helmet Heat and seamless gutters. We are licenced, certified and insured for your protection and peace of mind. With our excellent products and professional crew, you can expect your home improvement project to run safely and smoothly, from start to finish. Give us a call before clogs and other issues compromise your gutter system’s draining performance. We’ll help pave the way to a dry and damage-free, maintenance-free home with our high-quality protection systems. Call us today at (866) 252-9400 to schedule your free in-home consultation.